For my latest photography assignment, my partner and I were challenged to come up with a news pitch incorporating a headline, tagline, and images. Our subject matter revolved around the world of Facebook and disclosure of too much personal information via social networking. At first, we weren’t too sure on how to create a bold, visually appealing photo story that would also be newsworthy, but after brainstorming and surfing the web, some creative ideas emerged. We took a picture of a typical Facebook profile page and then made it pop using bright yellow caution tape. The stripes in the background were used to resemble jail cell bars, depicting crime that occurs when people are taken advantage of online. Internet users, especially teenagers and adolescents, need to be more cautious and aware of the information they post for the world-wide web to see. Anyone can view one’s personal page despite what privacy settings say. 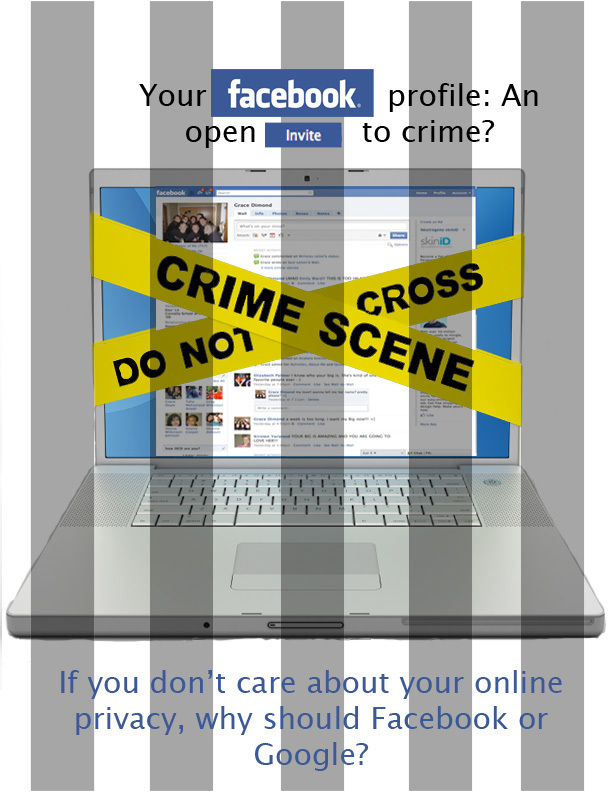 Don’t be the next victim of internet-related crime. Protect yourself, and think twice before posting personal and potentially destructive information online.